Today, we have a polish that I pretty much just bought for the name. As soon as I saw that Emily de Molly had made a polish called "You Don't Own Me," I dashed over to Llarowe's Facebook page to find out if they'd be stocking it. I'm guessing Emily de Molly named it after a classic song by Lesley Gore, but all I could think of was a scene from American Horror Story: Asylum in which a young nun possessed by the devil puts on a red negligee and sings the song to a crucifix hanging on the wall. Yeah, it was a strange show. It was also my favorite show last fall/winter, so I definitely wanted to snag a polish that reminded me of it! 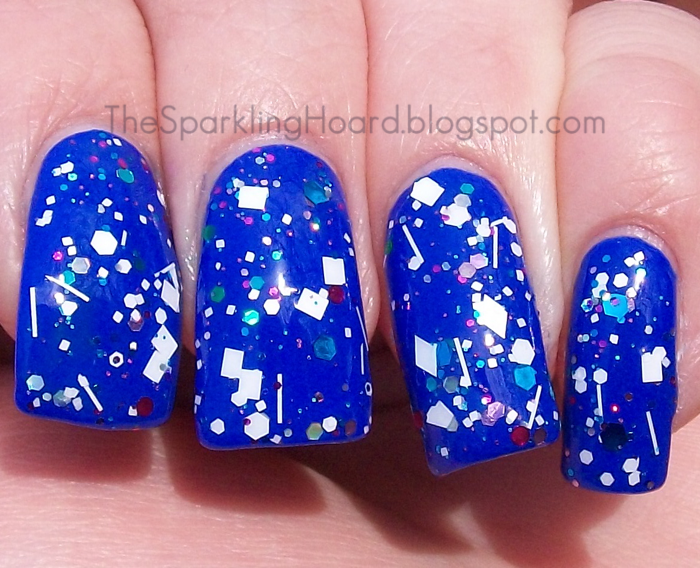 You Don't Own Me is a glitter topper in the Connect the Dots/Sticks n Stones style. 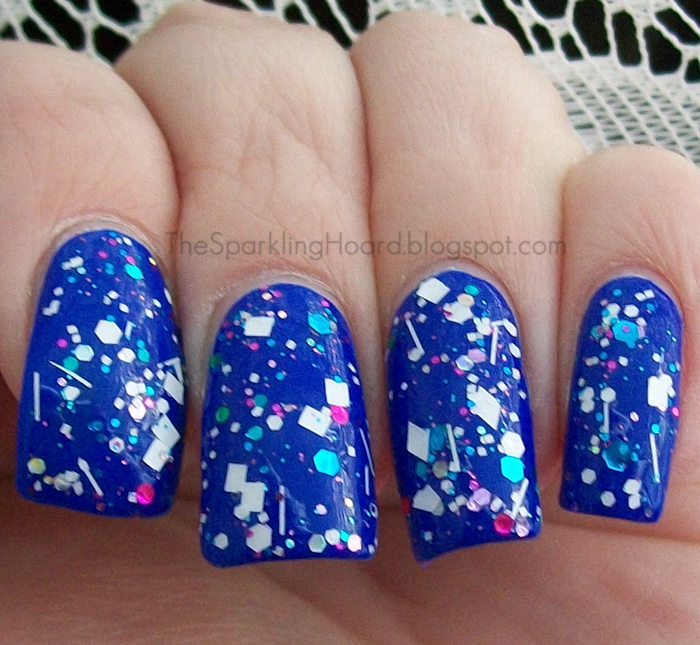 It features long and short matte white bar glitter, matte white diamond glitter, matte white hex glitter in 3 sizes, matte white square glitter in 2 sizes, small blue and pink circle glitters, and a mix of metallic and holographic hex glitters in various sizes and colors (gold, lavender, pink, blue, green). Like many glitter toppers of this style, it was slightly thick, but it applied just fine. Dry time was average. Shown is one coat of You Don't Own Me over Indigo Bananas Klein Trink Wasser. 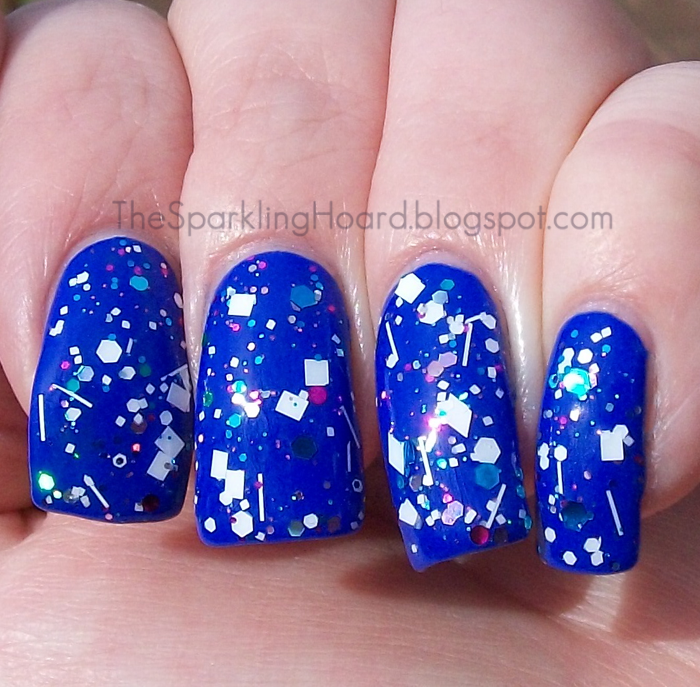 Such a cheery mix of glitters! You Don't Own Me costs $13 for 12mL on Llarowe. Emily de Molly is also sold on Etsy, Femme Fatale, Shoppe Eclecticco, and Norway Nails. You can stay up-to-date on Emily de Molly news by following them on Facebook.